Spanish surrealist painter, Salvador Domingo Felipe Jacinto Dali y Domenech made a dramatic impact on the world with his often bizarre, always striking and beautiful artistic images. Best known for his brilliant “The Persistence of Memory” where “melting” clocks are draped across a barren landscape, Dali’s work was always creative and imaginative. As for entertaining and thought provoking, Dali’s work never disappoints. It is this brilliance and talent that is the foundation for the Dali museum which houses some of the finest art in the world. Opened in 1974 in Dali’s home town of Figueres in Catalonia, the Dali museum also bears the distinction of being the largest surrealistic object in the world. The site originally housed the Municipal Theatre which was constructed in the 19th century and was destroyed in 1939 at the end of the Spanish Civil War. However, where everyone saw ruins, Dali saw an opportunity to create a piece of history and he built his museum. Currently, the Dali Theatre-Museum houses approximately 1,500 pieces of art of varying mediums from sculpture to painting and drawing, from engraving to photography and much more. An approximately 2 hour train ride from Barcelona or just 30 minutes from Girona (see RENFE for timetables) will bring you straight into Figueres where the museum is just a 15 minute walk from the train station. Signposts from the station to the museum guide you on your trek. It should also be noted that the museum’s galleries are accessible by wheelchairs and there are some wheelchairs available for patrons to use in the museum. There are also coach excursions from Barcelona to Figueres that include a visit to the Dali Museum or you can book a private Dali Museum tour with your own vehicle and driver. Because of various exhibits that are somewhat extraneous of the permanent collection, there is always something new to discover. Even the museum tours vary. A one hour long tour of the museum with a volunteer guide may highlight Dali’s interest in Freud while another may place an emphasis on science, mathematics or art history as they relate to Dali’s life. Other tours are also available which focus on other featured artists such as Andy Warhol and there are even theme based shows. There is something for everyone and the variety appeals to a wide range of artistic and creative palates. Two hour, specialized tours are available but require advanced booking of at least two weeks. Of course, choosing to roam the museum on your own and explore its rich offerings is also a very viable option. You may want to set aside two hours or more if you are an avid fan of Dali’s works. There is a clearly marked path for individuals who wish to head out on their own. The museum is home to many of Dali’s paintings and artistic works; although his most famous and best known pieces are the private property of several American and Japanese individuals thus they are not on the grounds for viewing. However, you can certainly see a great many of his works and the themes run strong through the collections that are on site. And these works are no less breathtaking. 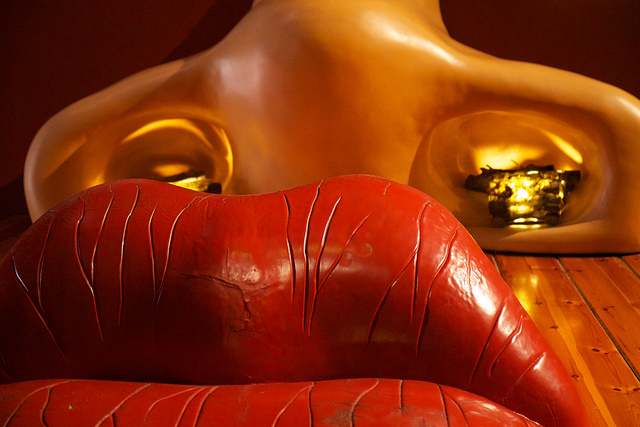 Your tour of the Dali Theatre-Museum begins before you even cross the threshold. The building itself is a bold statement to Dali’s genius and brilliance. Its massive dome stands as a distinct landmark in Figueres. The architecture itself is a work of surrealist art. Inside, though, it is vital that you look around you. If your focus is maintained solely on the artwork you will certainly miss the “Dali touches” that adorn the interior, including the floors, walls and ceilings. The minute details and Dalianian touches are sure to surprise and delight. It is no secret that Dali was not only eccentric, but also somewhat egocentric. He worked some aspect of himself into many of his works. While this did earn him some degree of criticism from some, it made his works no less spectacular. Keeping these traits in mind, though, when you wander down to the basement and explore the galleries brimming with works that seem to be the product of a psychological meltdown (as is true Dalianian style), you will eventually stumble upon his crypt. How fitting! Even in death he still manages to shock and catch you off guard! The Dali Theatre-Museum is child-friendly and a wonderful way to spend an afternoon. Around each corner lies a new discovery, a fascinating optical illusion, a stunning sculpture, a painting of melting things, you never know. To step into the museum is to enter the surreal world that brings life to light in ways you may never have dreamed of. Let your imagination guide you. For the latest information about opening hours, entrance fees and tours please refer to the official website of the Salvador Dali Theatre-Museum.